A Slice of Smith Life: Wordful Wednesday-Happy Birthday to Cupcake # 3! I am taking a break from packing for a family vacation by writing this special post for our dear Cupcake# 3! As you read this post, our family will be in TN at an amusement park for 2 days and then camping in the NC mountains and I'll be away from a computer all this week and into the weekend. I look forward to posting about our adventures when I get back! While we are traveling, our daughter will turn 7 years old on Friday, June 10! 7!? I can't believe it! Your big sister is wearing a pink t-shirt that says "I'm the BIG Sister" and your big brother is wearing a blue t-shirt that says "I'm the BIG Brother". I made these shirts for your siblings and wrapped them up for your brother's 2nd birthday. At his party, they each opened the t-shirts and this is how we told family and friends I was pregnant with you! It was very exciting to share our joyful news in this way! Your big sister and brother loved peeking into your bassinet to watch you sleep peacefully! They were in awe of you and loved giving you lots of hugs and kisses! Here you are sleeping on Nana's lap on the beach for your first trip to the beach and your first 4th of July. 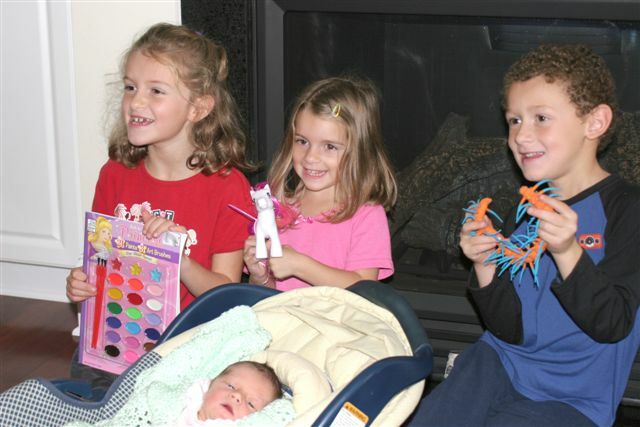 You became a BIG sister on Nov. 19, 2007 when your little sister was born! Here you are with another missing tooth! Happy Birthday sweet girl! You bring so much joy and love to our lives! We are so blessed to have you in our lives! Your family is adorable! Congrats to the birthday girl! What great pics! Happy Birthday to #3 and have a great trip! Hope you are having a wonderful time on your vacation. Happy Birthday cupcake #3!!! Aw! Happy birthday to cupcake #3! Marin's 3rd birthday is coming up the end of this month... I have sketched plans for her cake and will be sure to send you pictures since we both enjoy decorating cakes! Prayers for a safe and happy trip... looking forward to hearing all about it! Happy Birthday to your Cupcake #3. How sweet to show pictures of her through her last 7 years. She's a lovely girl with a cute smile! I hope you're having a wonderful time on vacation! God Bless! Thank you Lynda! We had a great trip and my daughter is looking forward to celebrating her birthday with friends this Saturday at her gymnastics birthday party! Thanks Kim for the kind birthday wishes! Thanks for stopping by to say Happy Birthday! That's neat that our children share the same birthday month. This Saturday we are celebrating her birthday with friends at a gymnastics place and she wants a horse cake this year. But, she wants her plastic horse on the top of the cake so I may not have to create a horse from cake. I have to plan out how we are going to do this cake :) Looking forward to seeing your cake and I hope to post about our trip soon! Great to hear from you!